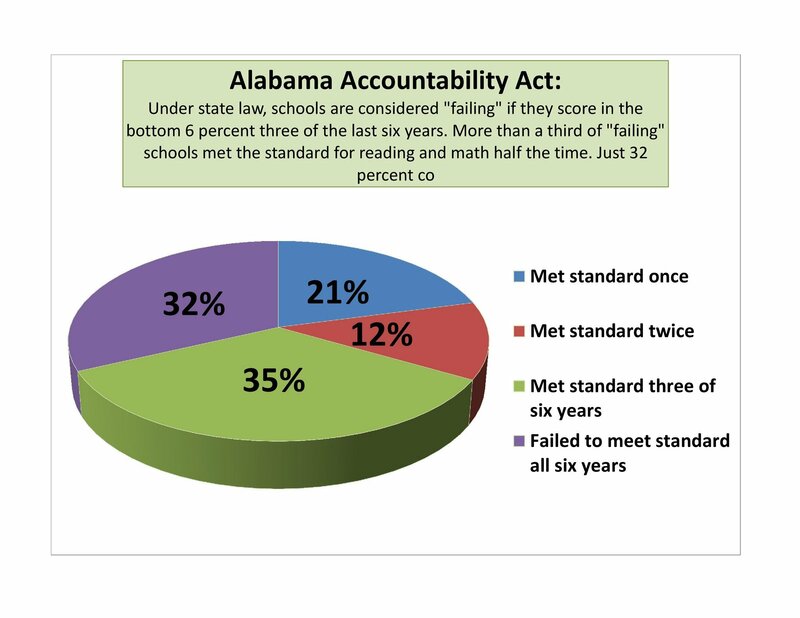 There was no such ranking system before the Alabama Accountability Act of 2013. No existing test provides a school-wide score to allow for ranking, especially between different grade levels. To meet the law, education officials had to invent a new score for each school. They merged scores across the two subjects, across three different standardized tests and across multiple grade levels to come up with one all-important “score” per school. The Alabama Department of Education complied, but only at the minimum level required, as state officials have objected to the usefulness and validity of the abstract measure. As a result, state officials now decline to release comparable “scores” for any non-failing schools. And they won’t provide ranked lists showing how non-failing schools fared on this new measure. That’s despite open records requests from this publication and requests from Huntsville school officials. “We have asked for the raw data and we have not gotten that,” said David Blair, school board member in Huntsville, a system that ended up with nine failing schools. He said it’s “disconcerting” to be placed on a list and not be able to draw comparisons with how far off the school was from non-failing schools. Dr. Melinda Maddox, assistant state superintendent, said not providing the ranks of non-failing schools is a matter of philosophy as much as practicality. She said the state is opposed to ranking schools, especially based on a score invented by state lawmakers. But she also said the state never created the complete ranking list and does not have such a record to provide. The end result is this: Over two decades of testing and labeling schools, never have Alabama educators released a list of troubled schools with greater consequences and less information. Unlike in years past, the “scores” themselves do not represent actual average test scores relative to national norms.Nor do they represent actual percentages of children meeting a standard on a specific Alabama test or specific subject. The state employed the two separate subjects, reading and math, on the Alabama Reading and Mathematics Test, the two subjects on the Alabama Alternative Assessment – taken by some special education students — and the two subjects on the state graduation exam. Picture a long string of fractions, said Maddox. So if a middle school has 100 eighth-graders, the state looked at how many passed the state reading test and how many passed the math test. That’s two fractions, 90 over 100, and say 80 over 100 in math. They averaged the fractions and came up with 85 percent. Then they combined numbers across grade levels. And then averaged in the results from the other exams, as necessary. Maddox said the law required the state to merge 9 million data points across 1,500 schools and six years. She said it took several weeks and three computer programmers working independently of one another to devise a list of failing schools. If the number has any value, it’s as an indicator of how may total testing attempts were successful, a sort of rudimentary pass/fail rate. But even that would not be a good point of comparison, as the rate would be influenced by how many kids took which of the three tests. And the number would not allow for comparing Alabama schools to national averages. And the method would offer no insight into whether students were improving or losing ground at a particular school. Both Maddox and department spokesman Michael Sibley said the state department did not want to rank schools. When asked for the full ranked list of all schools, Maddox said programmers queried only those schools that landed in the bottom 6 percent three times over the last six years. That’s what the law requires. She said that was all that was produced. Blair said Huntsville would like to know how close its schools were to passing, and has unsuccessfully asked for the cutoff scores for the 10 percent mark, the 25 percent mark, for the 50 percent mark, and so on. He said they have not received that information. Right now, Alabama knows that in 2012 Barbour County Junior High got a 62. And Alabama now knows that Essex High in Marengo County got a 71. But there’s no way to compare those scores with successful counterparts. No information is provided for any school other than those that were failing. Huntsville board president Laurie McCaulley said today that they’d like an official notice that the state will not provide information on the performance of non-failing schools. “We want it in writing,” said McCaulley. “This failing school list was done as required and is not — as far as the state department of education is concerned — is not the best indicator,” replied Sibley. Posted in Uncategorized and tagged #iBelieve, Accountability, Advocacy, Diversity, Education, Equity, Failing Schools, Public Education, School Choice. Bookmark the permalink.